Inshore and nearshore fishing along Florida’s Gulf Coast has as much to do with economics as it does with species. Of course, many inshore anglers long to be aboard a big sport fishing boat trolling the depths of the Gulf for fish of mammoth proportions. The reality, however, of a round trip that has fuel costs approaching that of the purchase price of a small outboard motor is staggering to many anglers. Inshore fishing, which includes small-boat, bridge, bank, beach and pier fishing, is much more accessible to the general public. So many game fish species come close enough to Florida’s Gulf shoreline that most anglers need only expend a minimum effort in catching dinner on a low-impact, low-cost outing. One species that’s of interest to both small boat and large boat anglers is the “convict” fish, or sheepshead. Sheepshead, found all along Florida’s Big Bend coast, are notorious bait stealers. During most of the year, these small-mouthed fish inhabit coastal oyster and rock bars, docks and rock jetties searching for their favorite prey—crustaceans, including small crabs, shrimp and even barnacles. It’s these smaller fish that are very difficult to catch, as their ability to crush bait, swallow the meat, and spit out the exoskeleton (with your hook) is unrivaled. Small hooks and small baits, such as fiddler crabs and cut shrimp pieces, are the key to catching sheepshead close to shore. Patience helps, too. Learning to feel the signature bite of a sheepshead takes time, and you’ll likely miss a few before you get into the rhythm. And, while the size limit on sheepshead currently twelve inches, a fish that size yields very little meat upon cleaning. It’s the bigger spawning sheepshead, usually found during the late winter or spring that excite Gulf anglers. These fish, found mostly in deeper water and around structures such as rock pies, reefs and old navigation markers, sometime reach weights of 10 pounds or more. When their spawning ritual begins, mature sheepshead will mill around structure and seemingly eat any bait presented them. Chumming with crushed crabs, oysters, barnacles or shrimp heads will increase the feeding frenzy. But don’t over-chum. They’re hungry, but they do get full. Spawning fish are mature, larger fish and their mouths are bigger. Most anglers rely on whole live shrimp as bait. 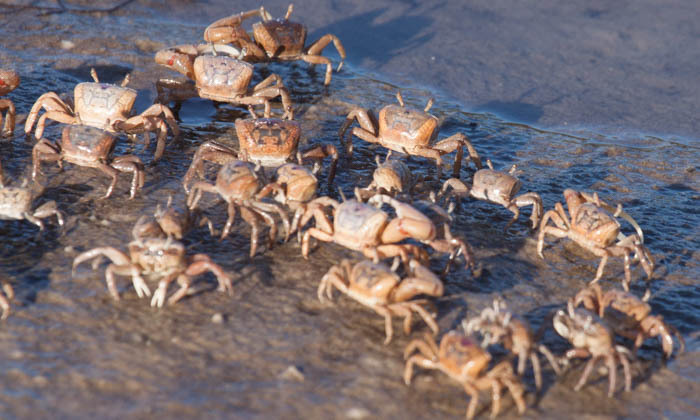 Fiddler crabs are excellent bait, too, but they’re sometimes hard to find. Fiddler crabs can be found on shallow beaches all along the Big Bend, as well as at local marinas during the early spring. To catch sheepshead, a simple knocker rig and a sturdy size 2 hook is sufficient, but many anglers simply thread a shrimp, tail first, onto a 3/8-ounce jig head. The advent of braided fishing line has certainly hurt the sheepshead population in the last few years, allowing anglers a better feel for what’s going on down below. Many sheepshead experts agree that you have to set the hook on a sheepshead before it bites, or you’ll miss the hookup. Sheepshead are delicious to eat but as difficult to clean as they are to catch. Big-boned and heavily scaled, the meat-to-total-weight ratio of sheepshead is low, and many anglers opt to clean them with electric knives. And, no matter how good the meat, cleaning the unrealistic legal limit is a chore. 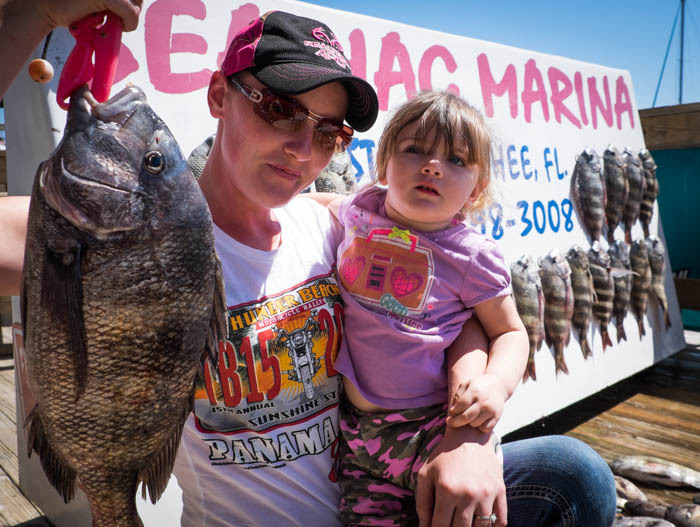 Take what you can eat that night and not the eight-fish limit, remembering that big spawning sheepshead represent the future of that species. 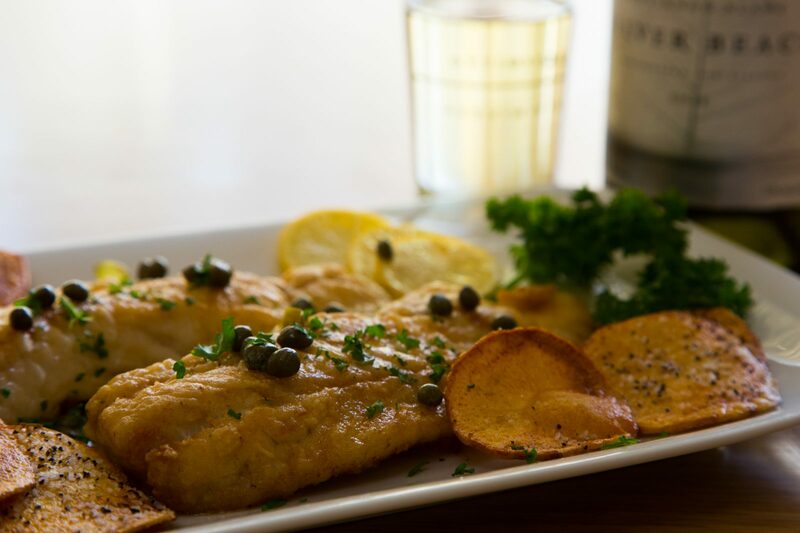 Sheepshead fillets, piccata, is an excellent way to prepare this species. It also works well with other fish, such as spotted seatrout, snapper or grouper. Heat a large skillet over medium-high heat. Once hot, add the olive oil and 2 tablespoons of the butter. Season the fillets with salt and pepper and dust lightly with the flour. Once the butter foams and begins to brown, add the fish fillets, turn the heat to high, and brown well, turning once, 4 to 5 minutes total.